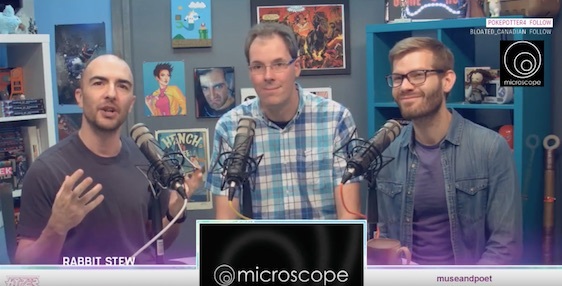 Back with the fine folks at HyperRPG, talking about Microscope. And a bit about Follow. And West Marches. And Braunstein. And Pokemon Go. We cover some territory, we do. The bad news is, I have no idea why there is jazz playing the whole time. We couldn’t hear it in the studio. Yeah, it’s kind of maddening. My apologies. You can’t see the chat screen, but that’s why I keep looking off to the side: I’m reading the live comments from the audience, the eponymous Chat, you glorious bastards you.